Your Shocks are shipped with NO pressure in them. You need to charge them with shop air or nitrogen. Nitrogen is the best option. 1. Shock shafts extend and compress in a linear path while most suspension components travel in an arc. 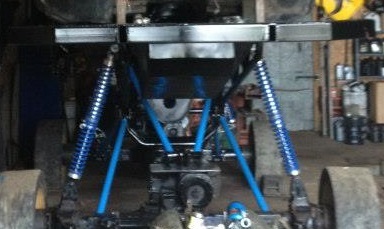 As a general rule, the shock should be mounted so the shaft is as close to 90 degrees, to the axle at full compression. 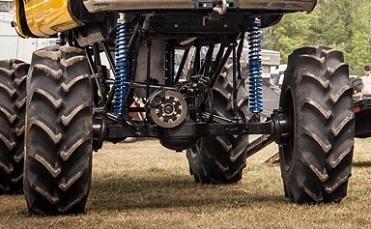 Bump stops and limit straps protect your shocks and your truck from damage. 2. Shocks and reservoirs should be securely mounted taking care to provide ample clearance between the shocks and the tires and/or chassis throughout the entire range of motion to prevent damage to the shocks from contact, or excessive side loading or binding. When clamping remote reservoirs locate the hose clamps at either end of the reservoir to allow expansion and prevent crushing the cylinder. Make sure hoses will not rub against the chassis or body panels or come in contact with sharp objects that may cut into the hose. 3. Care needs to be taken when welding or grinding. Grinding sparks and weld splatter can damage shafts, hoses and shock bodies. When welding around your shocks, make sure the ground strap is directly adjacent to the area being welded. If the welding current is allowed to travel through the shock shaft and arc to nearby metals, permanent damage will be made to the hard chrome plating on the shafts. 4. Never remove a suspension bar while working on truck, It will fall over and wreck parts. If you are building your own chassis or upgrading to Big Shocks on your existing vehicle you will need to know some information before you place your shock order. The suspension will need to be cycled from full extension to full compression so usable suspension travel can be measured. You will need to determine the desired ride height. The weight of the vehicle will be needed to help determine spring rate. If you have no access scales you can call us we can help. Is the vehicle front engine, mid engine or rear engine? What is the front to rear weight ratio? What size tires are you using? Will you be jumping? The more detail you can provide the easier it will be to design your shocks. We accept unused product returns for 30 days from the original ship date. To return an unused product you must call for a return authorization and the product must be shipped freight prepaid. In some instances products may be returned after the 30 day time period, but in these cases you must call for authorization, you will be subject to a 10%-20% restock fee, products must be shipped freight prepaid, and these instances will be handled on a case by case basis. Unfortunately there are absolutely no returns on custom or "one off" products. These items are made specifically per customer and are unsellable to the general public. Therefore, once you buy it you own it. Due to the enviroment and harsh conditions of most offroad use, there is no warranty on Big Shocks. We do not warranty against flagrant disregard for common sense. For instance if you are using 12" Travel 2.25 Emulsion shock for a TGW freestyle event, the shocks are going to break and will not be covered by any warranty. MAP (Minimum Advertising Price) Starting January 1 2017. What Is Minimum Advertised Price? Minimum Advertised Price is an agreement between suppliers and retailers stipulating the lowest price an item is allowed to be advertised at. Retailers can incur sizable fines and/or penalties from their suppliers for violating MAP. Minimum advertised pricing (MAP) policies are particularly critical to dealers for online resale, given the ease at which consumers can now conduct online and mobile price comparisons. Big Shocks in its sole discretion, reserves the right to discontinue doing business with any reseller that advertises any product(s) covered by this MAP Policy at a price lower that the MAP. Big Shocks, Minimum advertised pricing (MAP) is BigShocks.com website pricing. Starting January 1 2017. Wholesale accounts that use Big Shocks Website agree not to share this wholesale pricing with non-employees. Any wholesale account that violates this agreement will have their Web site access blocked. Breach of confidentiality will also result in their account being placed on retail pricing at the discretion of Big Shocks.com. BECOME A BIG SHOCKS DEALER Starting January 1 2017. A Dealer Must sell at MAP (Minimum Advertising Price) or will be removed as a dealer. A Dealer Must have a tax ID number on file with Big Shocks. our annual $10,000 buy-in requirement. Big Shocks will make drop shipments for no extra charge for its Dealers.